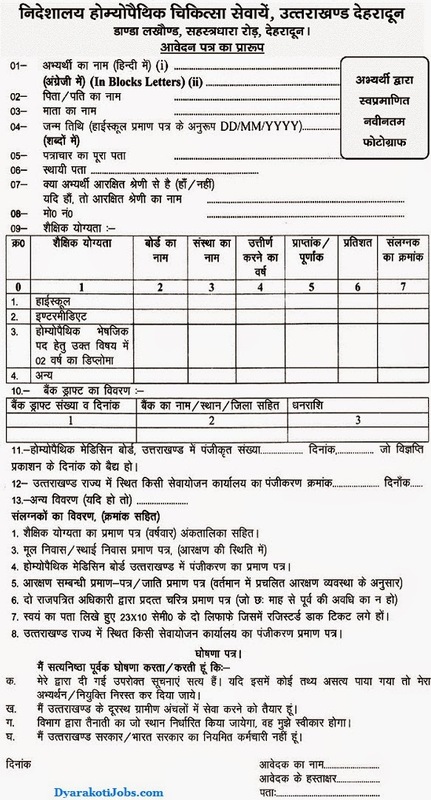 Directorate of Homeopathic Medical Services Uttarakhand invites applications in the prescribed format from eligible candidates for filling up the following Govt vacancies of Homeopathic Pharmacist by direct recruitment. Latest information related to Uttarakhand Homeopathy Jobs as vacancy details, age, qualification, fee, how to apply, application form etc. is given below. Candidate should be registered in the Uttarakhand Homeopathic Medicine Board. Candidate should also be registered in any of the Employment Offices of Uttarakhand before advertisement publication date. The fee can be remitted in the form of Bank Draft drawn in the favor of “Director Homeopathic Medical Services, Uttarakhand Dehradun” from any Nationalized Bank. Eligible and desirous candidates may submit their application in the prescribed format complete in all respect along with two envelopes of 23×10 Cms size affixed registered postal stamp and self-attested copies of all essential documents by Registered Post/Speed Post to the “Director of Homeopathic Medical Services, Uttarakhand, Danda Lakhond P.O.-Gujrara Sahastradhara Road Dehradun” so as to reach on or before last date. Search any information available on this site by the help of Google custom search box above. You may visit later for other latest updates related to Uttarakhand Homeopathic Department Vacancies.